Visae Patentes: After opposing ACTA, will Poland also turn against EU Unitary Patent? After opposing ACTA, will Poland also turn against EU Unitary Patent? In the European Union, the brave citizens of Poland were among the first to stand up against ACTA when their government announced on 19 January 2012 to ratify the controversial agreement. 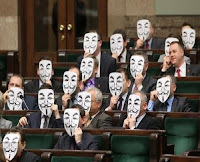 The public protests began on 26 January 2012 and on the same day some politicians expressed their protest in Parliament by wearing Guy Fawkes masks during the debate. In the end, Donald Tusk, Prime Minister of Poland, abandoned ratification on 17 February 2012 and declared that his earlier support for ACTA was a mistake. He even sent a letter to fellow leaders in the EU urging them to reject ACTA as well. Now it appears that Polish professionals consider the legal instruments against alleged infringers as provided by the Unitary Patent Regulation similar, or even more dangerous for entrepreneurs and SMEs than the regulations of ACTA. Also it is again critisised that the translation arrangement would disadvantage especially smaller Polish entities. In the light of the recent strong criticism of the unitary patent system in Poland, one could ask whether the Polish government may subsequently opt for “compromise” agreements, or whether it will join with the positions presented by Spain and Italy. Many interest groups in Poland have recently criticized the proposed regulations on unitary patent protection and have called on the government to withdraw its support for them. This initiative has officially been taken by members of the Polish Chamber of Patent Attorneys, but it seems that it has also found many enthusiasts among economists, scholars and politicians, including members of the Polish Parliamentary Commission of Innovation and New Technologies. The Polish Chamber of Patent Attorneys claims that the European regulations favour companies from the United States, Asia and large European corporations. Therefore, given the fact that Polish industry is still developing, adopting a unitary patent system could kill off innovation in Poland. Some scholars claim that according to the proposed regulations, the number of patents valid in Poland would increase by an additional 60,000 annually. Since these patents would be written either in English, French or German, Polish entrepreneurs would be responsible for their translation in order to check whether they are not committing any infringement. one could speculate that due to the negative buzz created by the controversy surrounding the ACTA-Agreement, the Polish government may, in the future, withdraw its support for the concept of a European unitary patent system, just as it did with the ACTA-Agreement in response to massive public demonstrations. The current reservation against the translation agreement in Poland does not fall from the sky but is consistent with the Polish opposition against the adoption of a language regime according to Art. 14 EPC (DE, EN, FR) when the country was among the most reluctant countries together with Spain and Italy in the days before the decisive Council meeting of 10 December 2010. The latter two countries finally prevented a pan-European solution which, in turn, was the reason for the establishing an enhanced cooperation approach. Poland's attitude towards IP rights might anyway be rather reserved, as could be learned from the country's opposition against the highly controversial Software Patents Directive in 2004.